We recently started to sign artists again who work with simplistic complexity. As we ourselves have lived on a healthy diet of clonks and bleeps for some time, we can appreciate this very much. So we are psyched to release the debut on Traum by British artist Padre. Padre recently released his "Chasing Mirrors" EP on the new label Derelicht with Löffler and Lakker remixes which you might have come across. The EP he has written for us however is very different in style. Padre is an expert in formulating deep but direct emotion through understatement and draws on exotic influences in rhythm and sound which he has come across during his worldwide travels. His sophisticated composition is a firework of sparking emotions that are intense but can burn down in a split second just to be substituted by follow ups. Padre loves antagonisms and we think the world needs more of those. His music is captivating and brave since he does not use the popular meaty sound bombast but rather acts with restraint and finesse. Padre lived in New Orleans for 5 years just before Hurricane Katrina. Until 2000 or so. He lived there to absorb the domestic reticular fusion of rhythms…. and to party. He has been teaching himself harmony through the BBC symphony orchestra and loves trekking in the Himalaya and besides that, all kinds of cultural "abnormalities" and good domestic deli food. His "Six Sisters" EP starts up with "Wetherby" (referring to a market town near Leeds in the north of England) and begins with a tidal wave of sound waves and small, quirky and twisted ones. There is a certain post Detroit character in all of this you will like. Maybe it is more bloomy though, like a walk though an ancient garden. The boost of sounds falls into silence or what you might call a fade out - before gathering speed again and returning to the busy and eloquent theme. Interesting for all of you who are into Kirk Degiorgio, B12, Black Dog or Warp's Artificial Intelligence series, for everyone who want to see that kind of feel transported into the year 2015. The great thing about "Wetherby" is that despite its well thought out mechanism of groove and sound it is by no means dogmatic but sounds rather like a maiden voyage, with lots of ardor and pizzazz. The title "Giulietta" derives from Padre’s favorite Fellini film from 1968.It also starts with a second of silence which manifest itself by a quiet sound that could come from an old analogue electronic machine before dipping into timeless elegance, compelling beats that are attracted like bees by honey and yearning chords that give it an extra bohemian touch. 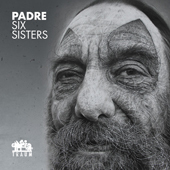 The title track of the EP "Six Sisters" plays in a secluded location, somehow haunting, strange, spooky and exotic. Maybe you know the extra scene in the directors cut of "Apocalypse Now", we refer here to the French plantation scene which explores the complexities of war, expanding on Coppola's indictment of the sanctioned lie, to illustrate a similar feeling. The track is powered by a mighty sub bass walking baseline, and noises which account for life transmission. Padre’s next title is simply called : "It Is Me". Is starts with a personal quote, gains speed and develops towards American minimal techno in the style of Daniel Bell. Minimalist house grooves accented by blips and bleeps accompanied by bizarre sound effects and eerie atmospherics connect it to the other trax here. The last track of the EP is a perfect ambient closing track. "Aquatic Uncle" is a nice termed title for these underwater echoing, all wailing and mysterious. The dynamic comes in slight waves or cycles. To listen to it is a sheer delight. 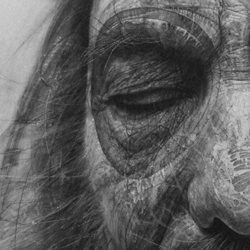 The cover is based on the highly detailed charcoal on paper painting „Garbed For Disco“ by Scottish artist Douglas McDougall.